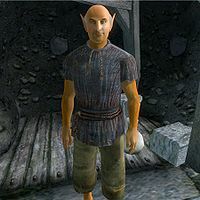 Gloorolros is a Bosmer commoner living in Crucible, New Sheoth. He will usually ask the player if they want to buy a stick, and conversations with him often end up on the subject of sticks. His hatred towards the beggars of Bliss will prove helpful during the Falling Awake quest, while his friendship with Bhisha will net you a tip or two during Ushnar's Terror. His bedroll is located in a hole underneath the stairs leading to the Sacellum Arden-Sul and he sleeps there every night between 10pm and 6am. After waking up, he wanders around near his bed until 10am when he finds his favorite spot near the entrance to Bliss where he spends the entire day offering sticks to citizens passing by. At 6pm he enjoys a one-hour meal seated on his stool next to the bedroll, then enters the Sacellum where he prays until his bedtime. Gloorolos wears a sack cloth shirt and sack cloth pants. He also carries a tan cup and a random piece of food. He has the disease Ataxia. When you meet him for the first time, he will make you an offer: "I've got fresh sticks. Guaranteed no leaves." When you talk to him, he will try once again: "Wanna buy a stick? I gotta fresh one right here. No? Then what can I do for ya?" Upon exiting conversation, he will comment: "The young folk just don't appreciate a good stick anymore." After completing the Main Quest, Gloorolros will greet his Lord with: "Ooh! You have a nice stick!" He will also be quite fascinated by your brand new stick: "Your stick is a lot nicer than mine, Sheogorath." and leave the conversation with a sad: "I wish I had a stick like that." During Ushnar's Terror, Gloorolros can see that his friend Bhisha is getting into trouble and will provide a bit of warning, in the process giving you a method to get rid of Bhisha. When asked about cat-hating Ushnar gro-Shadborgob he will say: "He loves dogs. Dogs like sticks. Dogs like meat. I wonder if they like meat on a stick? I saw Ushnar try to give Bhisha some of her dog's food once. I told Bhisha not to take it. Ushnar just wanted his dog to attack Bhisha." Also, when Amiable Fanriene needs a place to sleep during Falling Awake, Gloorolros will tip you: "Your friend ain't sleeping, eh? You could buy one of me sticks - a dreamstick, yes! Hit him over the head. Knock him into dreamland. No? Hmmm. Oh, here's a notion for ya. Uungor really gets on us nerves. You could kill -- or, persuade -- hisself to leave. Run him through -- or, run him out, I mean. Yeah, get rid of him. Then, your friend can sleep outside in Uungor's bed." If Gloorolros is killed, his tombstone will read, "In memory of Gloorolros. Sticks and stones broke his bones. ".